Thank you dear one for what you have done. You really are an angel! Mymonkey said he would love a Autumn look...hope you are doing well!! Thank you so much for all the diligent work...your the best!! Hi, Brandi! I would love to have one of your beautiful avatars! LOL Brandi! Crying is a good thing! It builds character! If I ever had a daughter it would be you that I would envision! I love art (I'm quite good), and my mother was an accomplished artist. You personify a true artist my dear! I'd love to work on an avatar for you. What would you like in it? Do you have any pictures you have seen that you like which you'd like me to use? People use all sorts of images to portray themselves here. It doesn't have to be a monkey. Could be anything you like! Get back to me with some more details about what you'd like and I'll get right on it for you! Thanks for coming by and making sure you are on my Autumn list. This year, I am only doing people who I know will come by and see/use them. I already made you a couple and will post them when I post all the Autumn avatars. Shouldn't be too long now, probably on Labor Day. Yes, you asked, but in the JSM thread! See, I told you I read every post, even when I don't post/sign in. I have done Luci and will post her when I post them all, probably on Labor day! P.S. Thank you for coming here and asking for one! I also worked on Autumn for you. One has leaves falling, one does not. I only used the one with the white ears, since you said you liked it the best. Hello! Dear Brandi could you PLEASE, PLEASE make me an autumn avatar?? Is there somewhere that you have written about how you do this/how you learned to do this? This is all new to me and so far I find it absolutely fascinating how you do this!!! You really do make this board beautiful. If it helps, I like anything nice, sweet, not mean or tough looking. Not sad. Something that makes people happy to look at and I would like a happy monkey or really any animal you have. Actually I would be happy with ANYTHING you make. I'm just so amazed with what you do! How do you make these things move? And the water on these looks like a moving fantasy. Really keeps me entertained. I just love images and computers and taught myself everything I could about manipulating and animating them. Do you want me to use the image you have now of the sock monkey and decorate it for Autumn or are you interested in a whole new look? Let me know and I'll get started on yours! Oh, thank you Brandi! I just love it! I think I will use the summer one for a couple weeks and then go with fall. It's so hot here right now, that water looks lovely! I am so happy you like it. 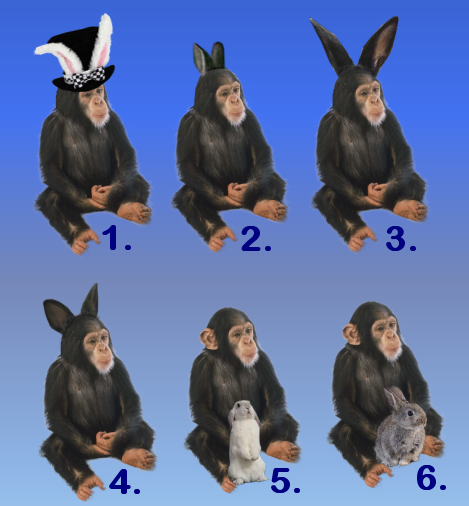 The bunny ears on the monkey was a perfect solution! I just finished making some choices for you and went to upload them to be able to post them here, and photobucket image hosting is down for maintenance! If I cannot get them posted before I go to bed tonight, I'll post them tomorrow. Photobucket came back online, so I can post these to you. 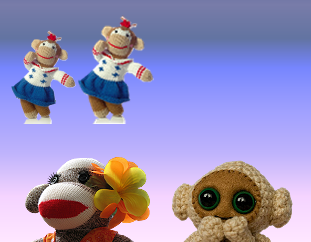 Here are some sock monkeys to use, if you like any of them. I included your original, one upsized a bit. Then I designed a summer-themed one with one of them since you mentioned how you like to look at animated water. Then while photobucket was down for maintenance, I saw this one in my files that I thought was a cute monkey. I made his eyes blue then put him into an animated waterfall background. I am a little out of ideas for the night. Let me know what you think, and if you have any specific ideas of what you would like. I guess it is time for my love monkeys to get out of the pool. can you please decorate my avatar? I love flowers so I was thinking of them holding an aster or other fall blooming plant. But I will go for almost anything You are the best. Brandi, you're self-taught?! Your work is amazing!! My avatar is not only outdated and simplistic, but is not even a Monkey one! (egads!) Could you make one for me when you have time? I don't need anything fancy; I love everything about Fall and I'm so excited to finally have a "real" SM avi! Let me know if you like any of these or have any suggestions, and I'll be happy to make some more for you. Page created in 10.142 seconds with 19 queries.